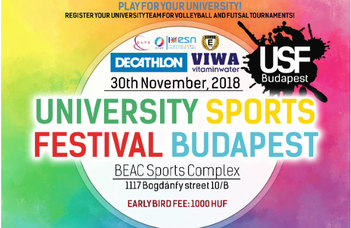 University Sports Festival Budapest 2018 – Let’s move together! Home > University Sports Festival Budapest 2018 – Let’s move together! Let’s move together – will be the slogan of the 3rd University Sports Festival Budapest which will be held on the 30th of November 2018, organized by Eötvös Loránd University (ELTE), Erasmus Student Network (ESN) ELTE and the sports club of ELTE, Budapest University Athletics Club (BEAC). Visit the webpage of ELTE BEAC for more details. Join to the Facebook event.